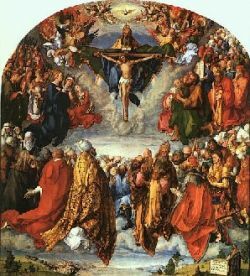 In any given diocese, a large number of parishes are dedicated to the Holy Trinity, to the Holy Spirit, or to Our Lord (usually under one of his titles, like Good Shepherd, or a Gospel event in his life, like Ascension). Another large portion honor the Blessed Virgin Mary under one of her many titles, like Our Lady of Lourdes. After this, a sizeable group have as their patron one of the Evangelists, Apostles or early Martyrs. For them, this hymn is quite appropriate. The text, From all thy saints in warfare, is often found in Anglican hymnals, and from there came to use in the Episcopal Church in the U.S. I found it again just recently in a old thin paperback called Church Hymns and Services by The Parish Press (Fort Wayne IN). The hymn was written by Horatio Bolten Nelson (1823-1913), the Third Earl Nelson, who compiled The Salisbury Hymn Book, which later became The Sarum Hymnal. His Saint's Day Hymn, quoted below, is his most popular text. The hymn can be useful to parishes whose title is mentioned, perhaps as their "patronal anthem," and to other parishes on the feast days whereon the saints are celebrated. There are four stanzas of this hymn. Stanza 1 starts the hymn — variants exist for the first line, for example, "By all Thy Saints still striving." Stanzas 3 & 4 form a suitable closing [and these three stanzas can be used alone as a general text]. Their crowns of living glory are lit with rays from Thee. And, walking in their footsteps, would serve Thee more and more. And honour, power, and glory ascribe to God alone. Who, worldly gains forsaking, Thy path of suffering shared. That we, what'er our calling, may rise and follow Thee. Whose labours and whose Gospel enrich our triumph-song. And all, as fruitful branches, in Thee, the Vine, abide. The Healer of the nations, the Sharer of our woes. And with true Balm of Gilead, anoint us evermore. Praise for the faithful record he to Thy Godhead bore. May we, in patience waiting, with Thine elect be seal'd. Thrice falling, yet repentant, thrice charged to feed Thy fold. And grant them dauntless courage with humble, earnest will. Forward to lead our brethren to own Thine Advent near. And count it joy to suffer, if so brought nearer Thee. May we, in patience waiting, with Thine elect be sealed. And him surnamed Thy brother; keep us thy brethren true. To wrestle with temptations till victors in the strife. Whom underneath the fig tree Thine eye all-seeing knew. That Thine abiding Presence our longing souls may feed. Thy perfect two-fold nature, the fullness of Thy love. And grant us faith to know Thee, true Man, true God, adored. Who, worldly gains forsaking, Thy path of suff'ring shared. One love, one zeal impelled them to tread the sacred way. And, bound in love as brethren, at length Thy rest attain. And, by thy parting promise, be with her to the end. Praise for the glorious vision the persecutor saw. So lighten all our darkness with Thy true Spirit's ray. Forsaking earthly treasures, sought riches from above. That Thy true consolations may through the world extend. Called early from the warfare to share the rest above. Lord, grant us hearts as guileless, and crowns as bright as theirs. Our true Elias, making a highway for the Lord. Make us the rather blessèd, who love Thy glorious Day. To aid in midst of torment, to plead at God's right hand. On earth the faithful witness, in heav'n the martyr-crown. As the Entrance Hymn for the parish Feast Day, using one of the more familiar hymn tunes above. As the Entrance Hymn for the Feast of these saints, using one of the more familiar hymn tunes above. As a communal opening for the Parish Festival. As an easy choir anthem, using a less familiar hymn tune. Look to organ preludes and free harmonizations for acccompaniment material. As a lead-in for each section of a concert based on the theme of Evangelists or Apostles. As a teaching tool or a project for the Youth Choir. As a short "invocation" at the end of Communion time on the Sunday before the saint's feast.